The following is sourced from a recent news release about PBS™ Manufacturing v.12.06. We hope you find it useful. Passport’s newest release of PBS™ Manufacturing 12.06 provides new productivity tools usually available only in higher-end ERP solutions that include comprehensive customer information management and strategic business reporting tools. Users can benefit from SSRS reporting and optional PBS™ Query Builder to create strategic business reports. PBS™ Manufacturing software for small businesses and mid-sized operations helps companies gain control of their shop floor, streamline their operations, and increase profits. PBS™ Manufacturing is a modular solution, allowing you to select only the modules that apply to your business. Passport Software provides manufacturing software for small businesses and mid-sized companies, as well as business, accounting and ACA software solutions. 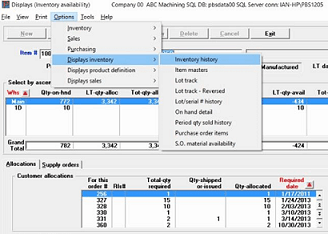 With sophisticated features at an affordable price, PBS™ Manufacturing software for small businesses is a powerful ERP software solution that provides manufactures tools for accurately planning and purchasing material, managing inventory, predicting and tracking product and job costs, and scheduling production. Founded in 1983, Passport Software, Inc. is a leading provider of business accounting and business management software, as well as ACA compliance management software. Our channel of North American and internationally-based partner professionals serve thousands of companies. To learn more call Dave Dorsey at 800-969-7900 x.145. Or Contact Us – We are here to help.